All Stand available in Floor & Bench Type, Rugged round column with increased height, Various force models available, Double acting cylinder, Parallelism adjustment plates, Throat depth 250mm, Micro-positioning facility, Hand driven gear type or optional motorized up down, Iron caste heavy base, Machine model in Time & Distance modes. Dual pressure facility for leak proof. Auto drain air filter. Accessories required: Clean & dry air @ 2 CFM , 1 phase stabilized electrical supply. Applications: Automobiles, Packaging, Medical Industry, Engineering & stationary. 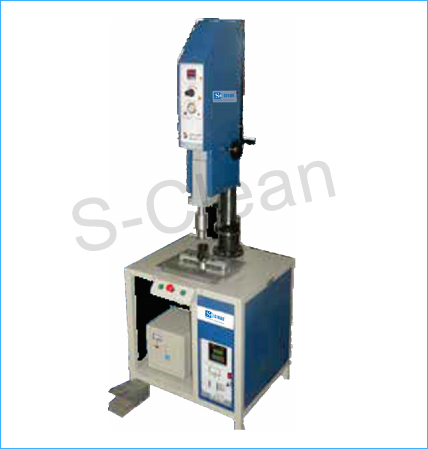 Model Frequency Power (Watts) Stand Press Weight (Kg) Generator Throat Dept (mm) W"xL"XH"
Ultrasonic welding guns are used to weld thermoplastic parts, where area of welding is hard to reach & the parts are bigger to weld. Pistol type & straight type guns available. Easy grip guns available with less diameter. Available in two frequencies 20Khz & 30Khz. Applications: Automobiles, Packaging, poultry manure belts, fabric cutting, stacking. Address : Unit No. 3 A & B, Ganesh Compound, Pawar Section, Chikhloli, Ambarnath (E) - 421505, Maharashtra, INDIA.